It's finally spring! Don't let the snow fool you, it's not cold in Montreal. Since we get so much snow during the winter months, we sometimes can have snow on the ground til April. While it's finally warming up, some light layering is very much needed and I'm kind of loving this wardrobe item as the perfect transitional piece for spring. Throw it over a blouse or light sweater with some skinny pants/jeans for the go-to casual look. This vest is so versatile, you can also wear it over a pencil skirt or bodycon dress! 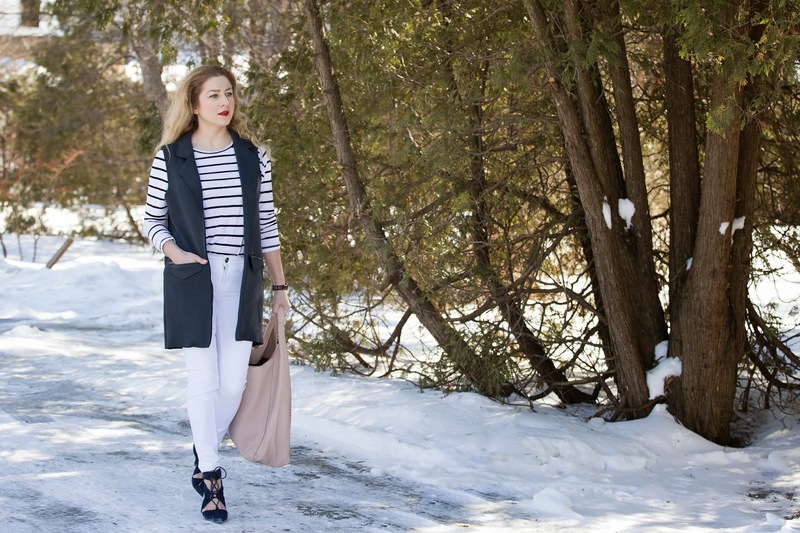 Beautiful vest paired with the stripes! Those heels are absolutely gorgeous. So gorgeous! Beautiful vest, this is such a polished and stunning outfit! Love this style of vest!! Nice Vest, its color is amazing. I like it and your bag too..
Just beautiful (the look and background). 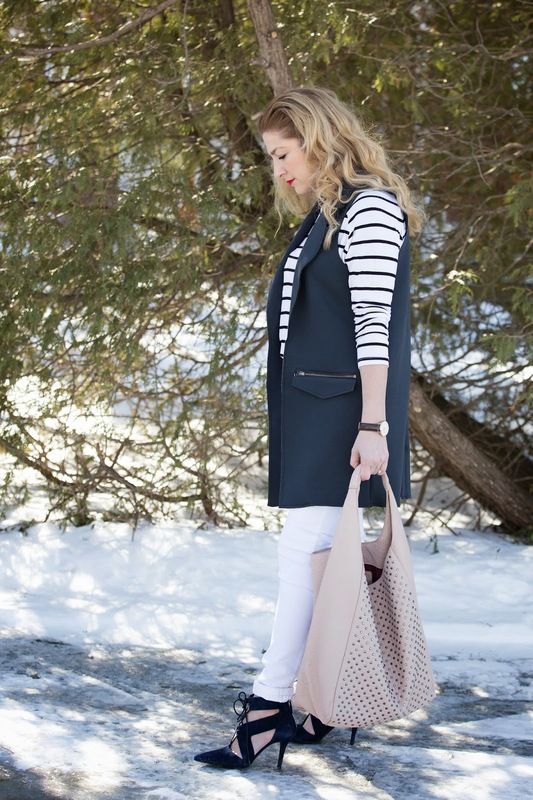 Love the navy trench vest. It looks so elegant the way you styled it. I own a sleeveless navy trench dress that I need to wear soon. Gorgeous - whoever made the rule in US that you can't wear white before Memorial Day is wrong, lol. Thank you for linking up to Thursday Favorite Things and we hope to see you again next week! Glad to hear spring has arrived, despite the snow! Love your white denim and stripes combo. I love your vest and this effortless look! Those heels are fabulous too! I love this outfit Crissy! I just bought a similar black trench dress that I've been wanting to wear as a vest. Thank you for joining TBT Fashion link up and hope to see you Thursday.